Gers is one of the least populated areas of Europe, devoid of tourists and remains very French, unspoilt and friendly. The numerous authentic and picturesque medieval villages are dotted throughout a mixture of wooded, hilly and beautiful open countryside. One can drive for half an hour in most directions and probably encounter no more than five or six vehicles whilst being able to appreciate scenic views one after the other. Famous for its foie gras, duck, Armagnac and prunes, the area abounds with excellent country restaurants where fine dining is taken for granted. The Roman spa town of Lectoure is but fifteen minutes away and provides excellent shopping and recreational facilities whilst the delightful towns of Condom and Agen are all within a thirty minute drive. Toulouse, Bordeaux and Biarritz are close enough to be visited for the day and during the winter skiing can be enjoyed in the magnificence of the nearby Pyrenees. Toulouse airport (80 minutes by car) provides scheduled services throughout Europe including several UK destinations. Agen (20 minutes by car) has daily services to Paris and accommodates all private jets. The TGV train is available from Agen to Paris throughout the day with a journey time of about 4 hours (soon reduced to less than 3 hours). 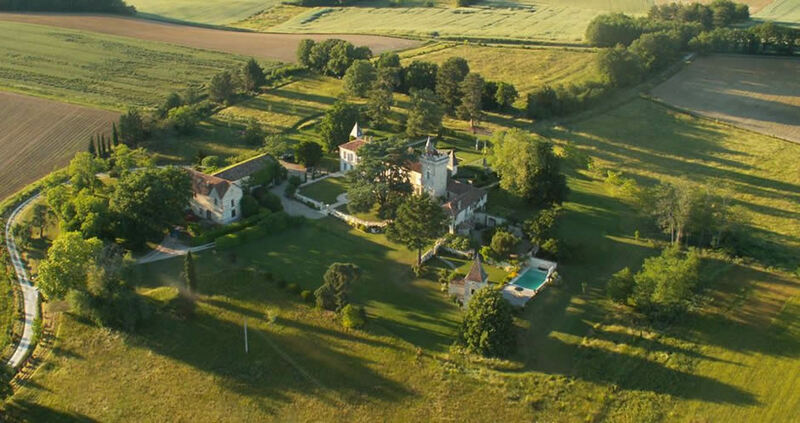 Chateau du Feuga and the surrounding area of Gascony are hidden gems left behind in time with a magic and presence all of their own; enjoying a tranquillity of crisp winters and warm sunny summers.